cuttlebug folder. 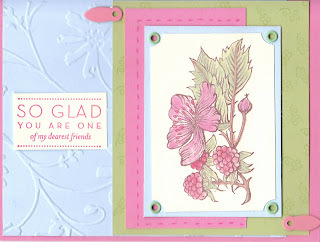 Then I stamped the celery piece with the flower stamp from basic backgrounds. The main image is from the retired SU set "Fruit Stand" and I stamped it with brown ink and then used blender pens and chalks to color it in. I added the green eyelets to the blue paper and then assembled it all together. I added the faux stitch lines with a Pretty in Pink marker and the pink tags in the corner to finish it. The next card I have to share with you is a card my daughter made last night. I must digress and tell a small story with it as well; and I hope you will indulge me. On Thursday, she came home with a less than stellar weekly school report. Her teacher sends home her papers and giv es any behaviour evaluations as well. As a result of her marks and teachers comments she has been grounded with no tv until next Friday. DH got called into work, so after the two little dudes went to bed, she sat in the living room with me and stamped. We turned off the tv and talked for about 2 1/2 hours. The next thing I knew it was 10:00. Now, I didn't get anything done; but I had a great time chatting and talking with my special girl. I told her that I would post her card today. I hope you like it. Have a great day and enjoy the rest of your weekend. Great cards. Love the pale blue colours. Pretty Card! Thanks for playing OCC~! Your challenge card is so soft and pretty! 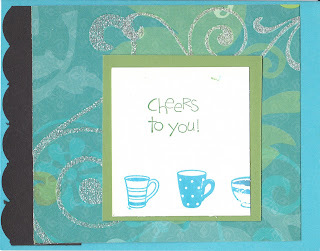 Love your little gal's card too - what a wonderful hobby to share with her!